Good Practice » EnercitEE Blog - EnercitEE is a European project aiming at enhancing the understanding of Energy Efficiency among different stakeholders and improving the respective local and regional policies. The exchange of experience on implemented mobility management measures between participating regions was carried out by SustraMM sub-project participants who collected and presented good practice examples. The good practices presented cover a wide range of topics, such as programs encouraging car commuters to use public transport, the support of bicycle traffic, mobility management measures implemented by companies, and training and outreach programs. Several mobility measures with the objective to encourage car commuters to use public transport were presented. In particular, the City of Cluses, France, is reorganizing four bus lines and offering free ridership in order to attract new commuters and to motivate higher usage of public transport. Furthermore, in Sweden, the Blekingetrafiken (public transport provider) offers free ridership during the first one to two months of usage to all car drivers that are willing to use public transport instead of driving to work. Additionally, educational and outreach activities are seen in programs such as The Blekinge Trip, in Sweden. The program is focusing on “the travellers of tomorrow” (i.e. 12-year-olds) by providing hands-on-experience on how to effectively use different means of public transportation and get to the desired destination. Students, traveling in small groups of four to seven people, typically plan a day trip by using buses and/or trains and afterwards they present their trip report in school. On 2 September 2011 the Lower Silesian EnercitEE regional management participated in an international conference „Energy Autonomy for the House, District, Community and Region” held in Wrocław, which was organized by the Free Entrepreneurship Association (Stowarzyszenie Wolna Przedsiębiorczość), a very active regional agent in the energy sector. Honorary patronage was held by prof. Jerzy Buzek, President of the European Parliament, and Rafal Jurkowlaniec, Marshal of Lower Silesia Voivodeship. 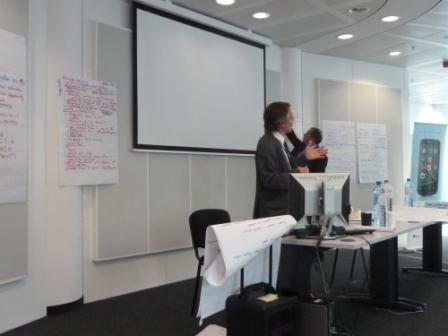 I had the chance to participate in a joint IEE & INTERREG meeting organised by INTERACT and EACI. The meeting took place in Brussels from 18 to 19 May 2011. The aim was to bring together different programmes and projects dealing with Energy Efficiency and renewable energy sources. It was great to see the variety of Intelligent Energy – Europe (IEE) projects presented there. IEE is a European tool for funding action to move towards a more energy intelligent Europe. Besides energy agencies funded by IEE a wide range of projects were present. Among others a projects supporting communities that signed the Covenant of Mayors such as COME2COM or ENGAGE. Other IEE projects aim at bringing together experienced and less experienced local authorities in implementing Energy Efficiency actions such as LEAP or CONURBANT. All projects can be further discovered in the IEE database. Besides IEE projects representatives of INTERREG IVB and INTERREG IVC were present and contributed to the discussion. The commune of Zschdrass is a small community nowadays belonging to the municipality of Colditz in Saxony. 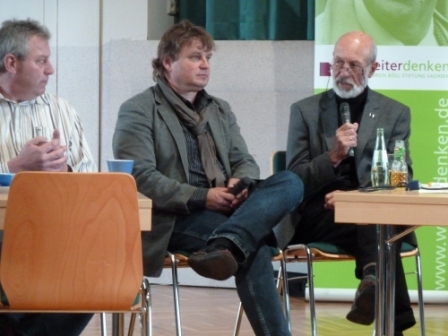 Zschadrass is one of the most active communes when it comes to renewable energies and energy saving in Saxony. They are also very innovative in developing new concepts for communal energy production. According to the Mayor Matthias Schmiedel the commune started looking into their potential of saving energy in order to reduce their operation costs. The local council decided to start with the most visible and the easiest: in this case the street lightening. After 12 pm street lights have to be turned off. After this they continued to observe the energy saving potential for communal building such as the gym and the school. Additionally, the commune was also looking for possibilities to keep the value added in the region which let also the vision of an energy self-sufficient commune in 2050. 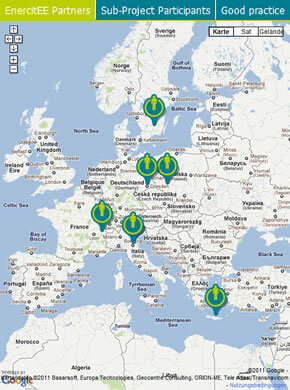 In February EnercitEE has been endorsed as an official partner of the Sustainable Energy Europe Campaign. EnercitEE received the approval of the European Commission to enter the Campaign and participate in the Awards 2011.